You may still be dealing with the embarrassment of having your asinine LinkedIn password posted online—I'm talking to you, BigPenis—but, honey, it gets worse. The popular dating site eHarmony has confirmed that an unspecified number of their 1.5 million users' passwords have also been leaked onto the internet today. This is probably an actual hassle—unlike a comprised LinkedIn account, which at worst would result in someone logging in and listing an internship at somewhere weird—because it could result in mortifying alterations to your personal dating profile. Or illegitimate solicitations of a date you do not actually want to go on. The security of our customers' information is extremely important to us, and we do not take this situation lightly. After investigating reports of compromised passwords, we have found that a small fraction of our user base has been affected. We are continuing to investigate but would like to provide the following actions we are taking to protect our members. As a precaution, we have reset affected members passwords. Those members will receive an email with instructions on how to reset their passwords. 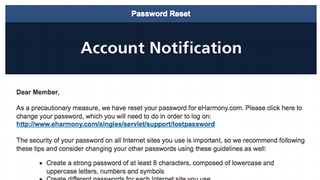 Please be assured that eHarmony uses robust security measures, including password hashing and data encryption, to protect our members' personal information. We also protect our networks with state-of-the-art firewalls, load balancers, SSL and other sophisticated security approaches. We deeply regret any inconvenience this causes any of our users.